Chances are you are already spending hundreds, maybe even thousands, of dollars if you are replacing carpet or installing new flooring. 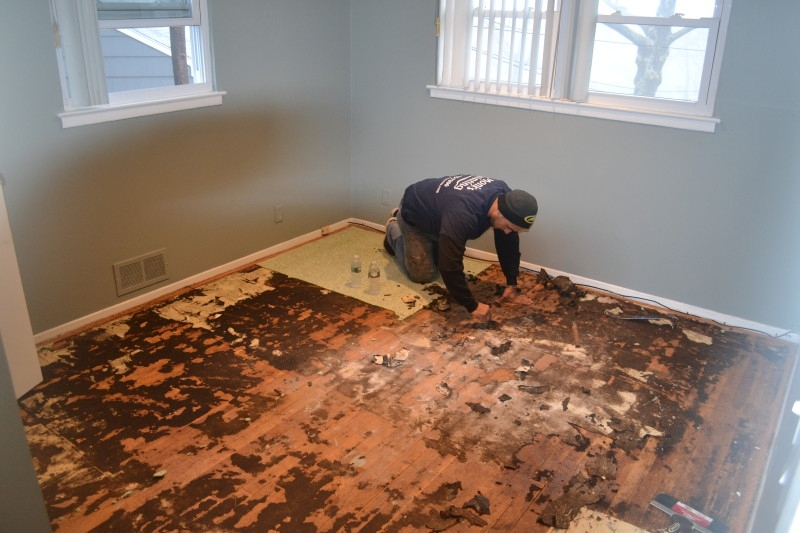 In order to save some money, you can remove the old carpet yourself before the installers arrive. This saves both time and money and is easier to do than you might think. Talk with the installer or your contractor to find out how much will be saved by doing the tear-out yourself. Then, remove any doors that swing into the room, including bi-fold closet doors. Doors that swing into other rooms can stay put. Clear the floor completely and remove all furniture from the room. Put on some gloves to protect knuckles from the abrasive carpet backing and from the tack strip (technically called a "no tack strip"). Also, wear a dusk mask to prevent inhalation of carpet dust and safety glasses to protect your eyes. Pull up the carpet from the tack strip along the walls. Start in a corner of the room and grab the carpet with pliers and pull. Now grab the carpet by hand and continue to pull it up along the entire length of the wall. Fold back about three feet of carpet and cut it into easy-to-handle strips using a utility knife. Carpet is much easier to cut from the back than from the front, so folding the carpet over is a great strategy. Use a sharp new blade of the utility knife. Be careful not to slice into the baseboard or walls. Duct tape can be used to roll up the strips of carpet for easy handling. Keep pulling the carpet back and slicing it into strips. If you're putting in new carpet, when the transition, or place where the carpet meets another section of carpet or other flooring, is met, cut the carpet and leave the transition in place. If the transition is metal and still in good condition, the installer may want it to be left in place. Doing so will save an average of $10 per transition. If you're putting in another type of flooring, or exposing a hardwood floor, you can pry the transitions up. Start at the top to remove carpet from stairs. Remove any metal nosing at the top of the stairs. You should be able to pull it off easily. If there's no nosing, cut the carpet near the top of the riser, grab the cut end and pull the carpet off of the stairs by hand. After the carpet and pad have been torn off, pull out the staples with pliers. Again, you can cut the large pieces of carpet into strips and roll up. On a concrete floor, the pad is glued in place – meaning some large chunks may remain stuck to the floor; use a floor scraper to remove them. On a plywood or particleboard subfloor, there will be hundreds of staples that need removal. This can be done with pliers, but this can take hours. For a quicker staple removal, use a sharp-bladed floor scraper. Obviously if there's no new carpet going down, you can pull up the tack strip. If you are putting in new wall to wall, in most cases the tack strip should be left in place. There are a few exceptions, however. Sections that are rotting, delaminating or badly rusted should be removed. It should also be removed if it is less than 1/4 inch away from the baseboard, for the installer needs a gap at least this large in order to properly install the new carpet. To remove the tack strip, pop it up with a flat pry bar. Every year, Americans dump about five billion pounds of carpet into landfills. Therefore, it is best to avoid throwing away old carpet to help out the environment. There are a number of alternatives to throwing it in the garbage. If in good enough condition, one can choose to sell and/or give away old carpet via sites such as craigslist.org. Many charity organizations will also take old carpets and rugs. Animal shelters and training facilities welcome pieces of old carpeting to use at the bottom of dog and cat cages. Recycling is also an option. It may be difficult to find facilities that will recycle carpet in the area, but it is always a good idea to ask the new carpet installer or local carpet supplier for more options. Server responsed at: 04/21/2019 8:30 p.m.